There is always an awe inspiring Mysticism about India. It is the Mysticism of our ancient Sages who were knowers of God and Alvars who were lovers of God. Sages observed penance to know Him; Alvars and Saints sung His glory in sheer ecstatic experience of Him. India’s heritage, culture, tradition and practices though diverse apparently, the spirit remains one. It is the spirit of piety and divinity. It is the spirit of Great souls to attain the Highest, in pursuit of which they have traversed places. 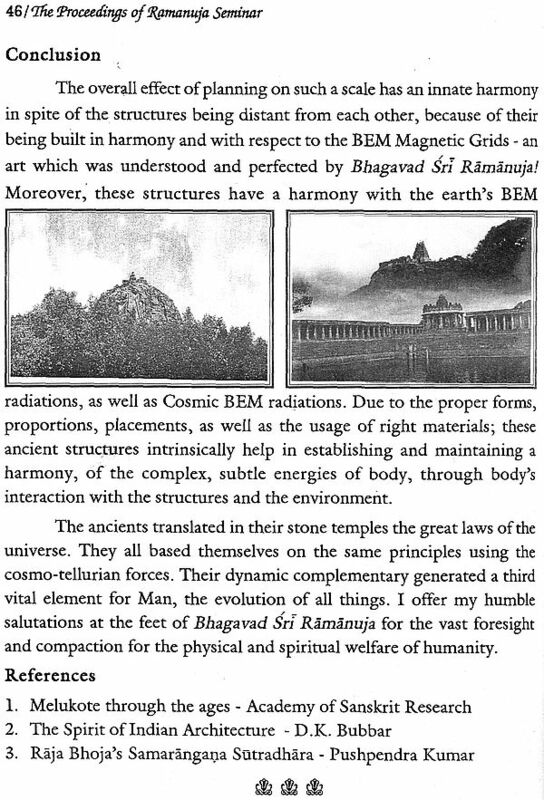 We come across many such places of divinity and sacredness all along which are all vibrant with enigmatic energy. The majestic Himalayas, the serene plains of Punjab, the demanding deserts of Gujarat, the magnificent hilly regions of her east, the great Ganges and Brahmaputra, the Narmada, the Krishna, Godavari and Kaveri along with marvelous temples of south and the great Indian Ocean are but a few glimpses of her varied geographical topography. But there is an enduring divine aura about them that underlie their mere physical presence. We are told in our great Epics, Puranas and Agamas that our ancient seers, sages, saints and ascetics have observed penances, carried on their noble deeds in them. The scheme of the providence would offer us with divine incarnations of itself to resurrect positive energy in them from time to time in all the ages. That is the binding faith that keeps us going against all odds. This current started from time immemorial is still flowing to be experienced in the visits of great places of worship. The temples are man-made but infused with godly aura and energy. They just do not remain mere orifices of stones but poetic by intricate sculpture, technically exquisite by architecture and design, and mesmerizing by divinely beautiful images of God. 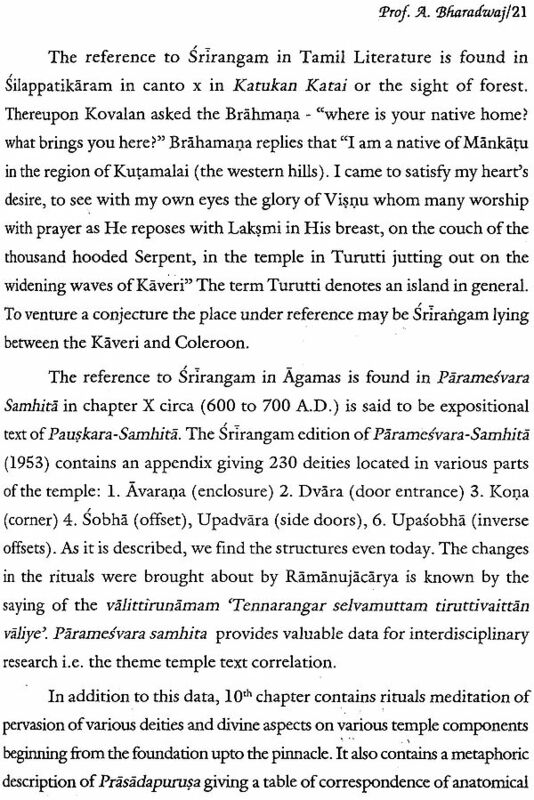 We have great mythological as well as Agamic accounts describing the excellence of sacred places called ‘Divya Kshetras’. 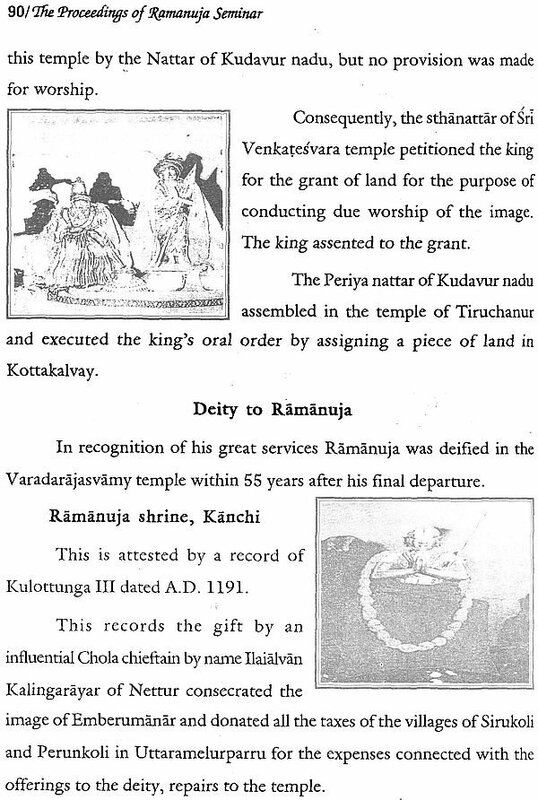 Among many such, some of them designated as ‘Svayam vyakta Kshetras’ are self-emanated ones like a piece of land jutting out amidst an ocean. 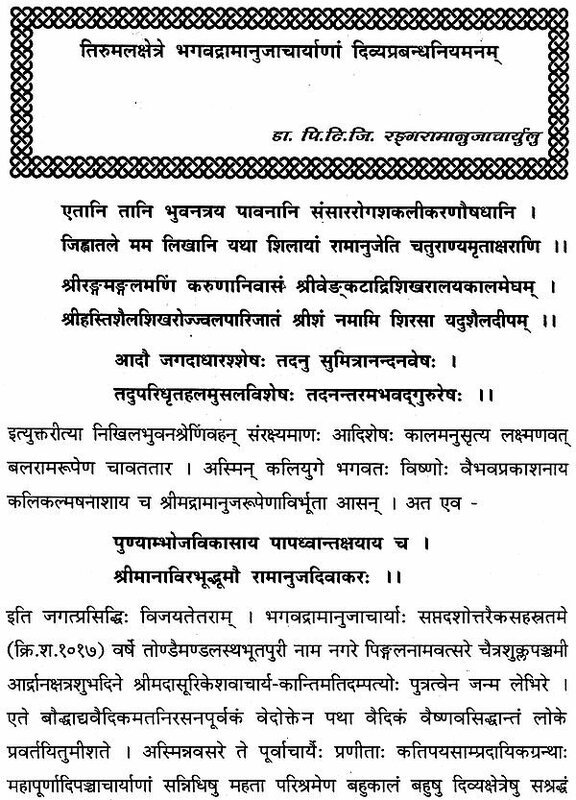 Thus we have ‘kshetra Mahatmyas’ in our Agama as well as Puranic literature. Similarly India has Produced greatest of philosophers, thinkers, poets saints, saints, seers, who have contributed immensely to the welfare of mankind. Bhagavad Ramajuna, an incarnate of the divine serpent of the supreme Lord Srimannarayana, who appeared in the eleventh century, was an amalgamation of all auspicious qualities. A realistic approach to life and philosophy, treading the path of devotion and service, above all an altruistic temperament of Ramanuja, Stood him in high excellence and exaltedness; this Acarya, the master of mankind shines like beacon for all journeying in darkness of kali-age. 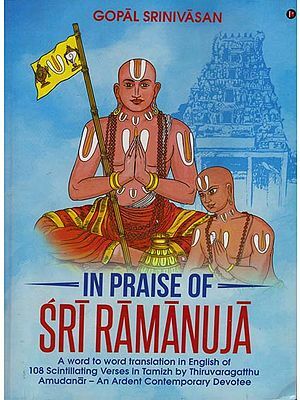 The present book is based on the proceedings of seminar on ‘Bhagavad Ramanuja’s contributions to four ‘Svayamvyakta Kshetras namely Tirupati, Kanchipuram, Tirunarayanapuram and Sri Rangam’ throw much light on the said topic. 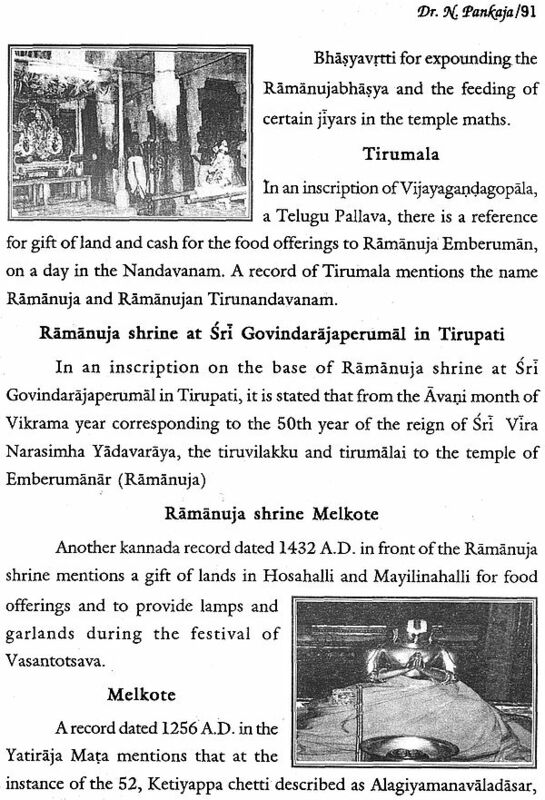 The four divine destinations mentioned here are unique in their own ways. 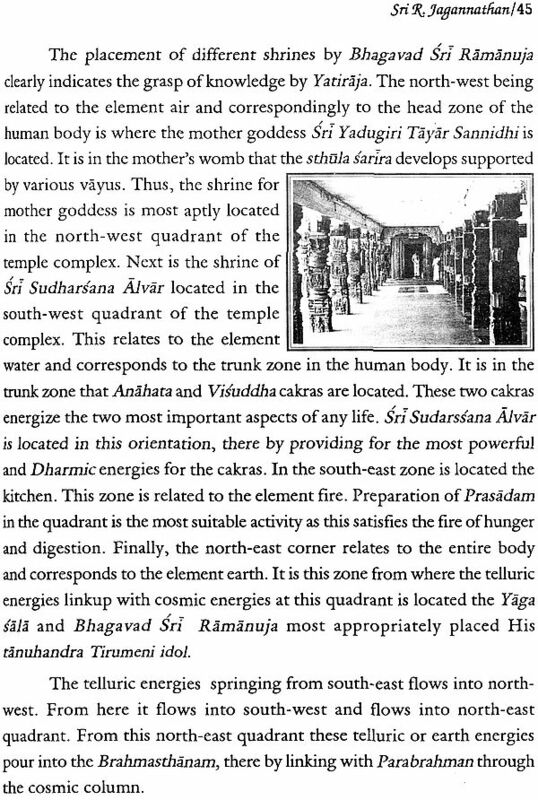 The tradition, culture, the temple festivities, the people, the ways of rendering Vedic as well as Tamil hymns of Alvars and special delicacies offered to the Lord at these temples are all unique and special to be cherished. These temple towns have a long history and rich heritage about them. 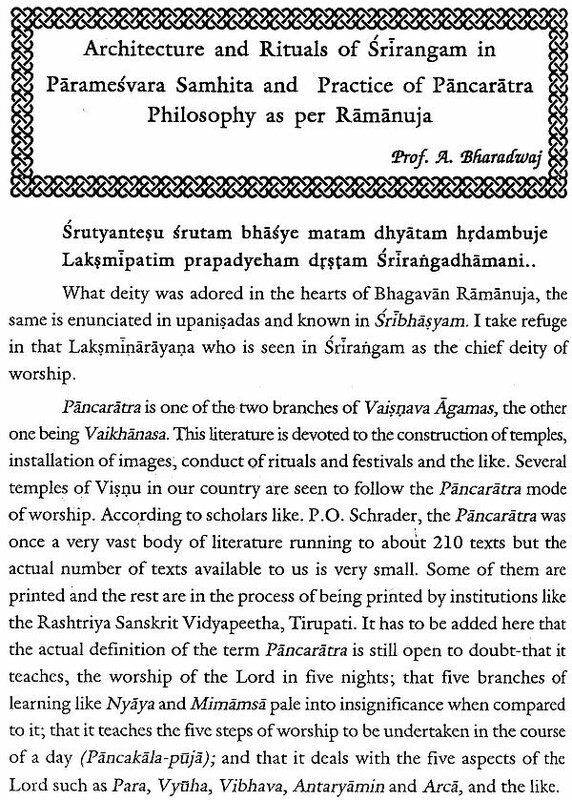 We have great input on Ramanuja, his contributions to these places, which have made them eternally divine and sacred. The presenters have provided us with valuable information and inspire us to take further investigation in to pages of history. Incidentally the present treatise is getting released in a seminar on ‘Managerial ability of Ramanuja’ organized by Academy with the support of Karnataka Sanskrit University, Bangalore. We take this opportunity to express our heartfelt gratitude to our joint sponsor Rashtriya Vidyapeetha Tirupati, for contributing Rs. 100,000/- towards organizing of seminar. It is our bounden duty to thank our managing committee and our funding agency the Government of Karnataka. The academy is beholden to all the speakers and contributors of research papers. 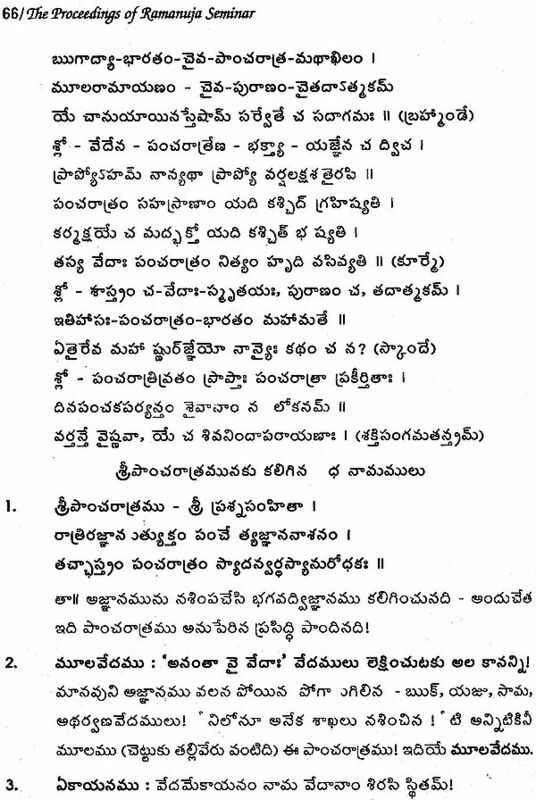 Our special salutation goes to Sri, Sri, Sri, Dr. Pr. Bhashyam Swamiji, Founder Sri Sudarshana Narasinha Kshetra, Mysore, for his comprehensively engaging Key-note address. We thankfully remember the dedicated efforts of Dr. Ranganath, Tirupati, Vid.S.Krishnan ASR and Sri R. Narayana Iyenger ASR and others in organizing and editing of the book. Thanks are to our DTP Staff, members printing section and to Designer Lokesh Mysore, Binder Prasanna, Mysore and others. We are delighted to offer this publication of good value at this juncture.